WARM-UP - Graduall build up in activities and tempo such as light joggin progressing to 80% with dynamic stretching incorpoated once plrs are warmed 5-8mins . PRACTICE - organise area of approx 20x20yds with 4 plrs on each corner cone &apos;plrs at coneA are the defending/pressing team - practice objective is for the coach/server to pass to either of the two plrs who enter area from coneB and on his touch one plr from A is to advance into area and become defender thiis will create a 2V1 game where the defender must gain possesioin of the ball or intercept once this is achived he and the two offensive plrs leave the area and the server then passes to two advancing plrs from coneC and a different plr from A enters and a mirror image of first game occurs when defender gains possesion the practice is repeated with plrs from coneD and a different defensive plr &apos;the whole circuit is done again whilst the coach times it, all teams move to next cone in a clockwise manner as so to ensure all teams have time as defenders at coneA. PRACTICE STRUCTURE/GOALS - the aim is for defensive team to get through six games as fast as they can and for the offensive teams they obviously try and keep each game alive as long as possible and add time on defensive teams total (time) giving them a better chance of beating the time when it is their time as defenders . 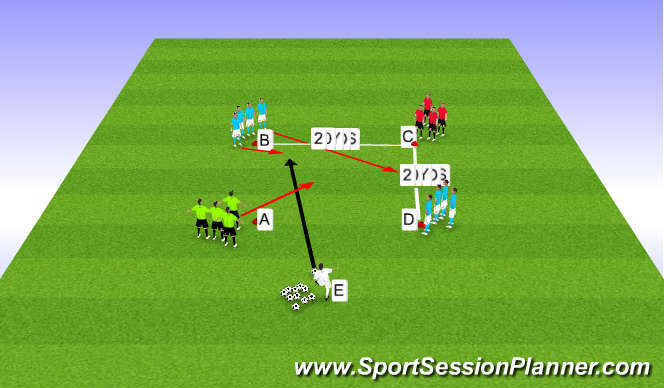 PROGRESSION - you can progress the practice by simply increasing the area and allowing three attackers in and two defenders creating a 3V2 game and further to that increase pitch again until in the end you have a 4V4 game and for a final half-pitch game finish with a 8V8 conditioned game. KEY OBJECTIVES - you will be able to observe you&apos;re plrs technical levels in their passing - control - understanding and decision making abilities in a game related enviroment &apos;the coach will determine what level of tempo the practice is conducted in by involving conditions i.e timing -one/two touch etc. control : correct surface presented for incoming ball - hips facing - cushioned ankle - eye on ball - arms out for balance and protection etc. .